This week, Stuart Pearce named his 40-man provisional squad for the summer’s European Under 21 Championships. Jack Wilshere and Andy Carroll were involved sparking frustration from Arsene Wenger and believers that once a player becomes a senior they should never turn back. So as I’m scrolling through the BBC Sport pages and really study the 40-man squad, I believe England have a genuinely top chance of winning the tournament. In every position their is pure class that could even compete at full international level. Established Premier League players will feature in what I believe could be England’s second trophy this summer, assuming the Under 17s win the European Championship happening at the moment! So here would be my first eleven for Stuart Pearce’s men, see what you think of it! In goal I would start with Alex McCarthy. I believe the Reading ‘keeper is easily the best thing outside of the top-flight. He’s taking a sort of “Joe Hart” approach to his England career at the moment and I believe this tournament could see him become a senior player in no time. At the back I’d start Kieran Gibbs on the left, already a full international and gives Gael Clichy worrying competition at Arsenal. Playing for a top-four side regularly gives Gibbs the experience he needs when he comes up against pacy European wingers. Micah Richards and Chris Smalling in the centre, two absolute tanks and regular features for their sides. Once again, as members of two top-four sides I predict they’d produce a solid defence throughout the tournament. Kyle Naughton would be my choice at right-back. He’s the future England right-back and has impressed me with his appearances at Leicester this season. Also he’s a firm favourite of the gaffer’s! In my opinion, Marc Albrighton deserved a call-up to the senior side earlier in the season, so it’s with no surprise that he features in this line-up. I’d play him on the wing. No wing in particular, i’d just have him constantly swapping with my other winger of choice, Scott Sinclair. Sinclair has been electric in the Championship this season and he’d be one of the first names on my team-sheet. He’s definitely one for the future if he plays in the Premier League next year. Him and Albrighton will tease defenders with their constant swapping. Through the middle I’d have the obvious choice of Jack Wilshere. 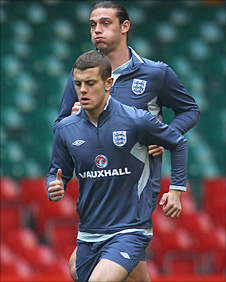 He’s already one of the best players alive and will certainly be a major factor if England are to win this tournament. Partnering him I’d have Jack Rodwell. Manchester United want him for almost £20 million so the kid has to be doing something right? Up the top it would have to be Andy Carroll, a powerhouse who will leave defenders trembling after meeting his presence. Another man who’s already a full international and now seems to be a regular on Capello’s teamsheet. With him I’d have to say Daniel Sturridge. Ignoring talent like Danny Welbeck, Conor Wickham and Gary Hooper isn’t easy, but Sturridge’s recent Premier League performances for Bolton have seen him become one of the most sought after Premier League strikers in recent months. Leaving out players like Jordan Henderson, Fabrice Muamba, Josh McEachran and Mark Davies isn’t easy, but when you have this much talent in your squad it is no wonder why I’m tipping England for great things this summer!